Vitamins & MineralsFA Nutrition Xtreme MVF - 30 sasz. FA Nutrition Xtreme MVF - 30 sasz. 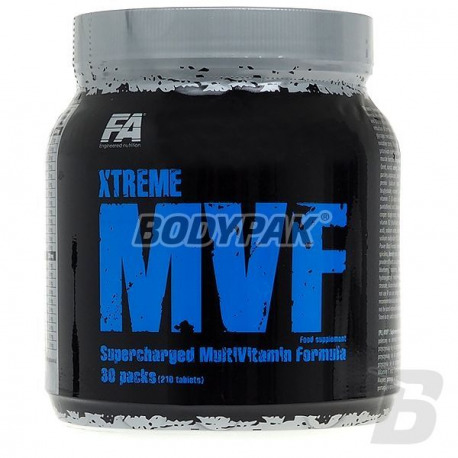 FA Nutrition Xtreme MVF - 210 tabl. Xtreme MVF® a complete vitamin formula. 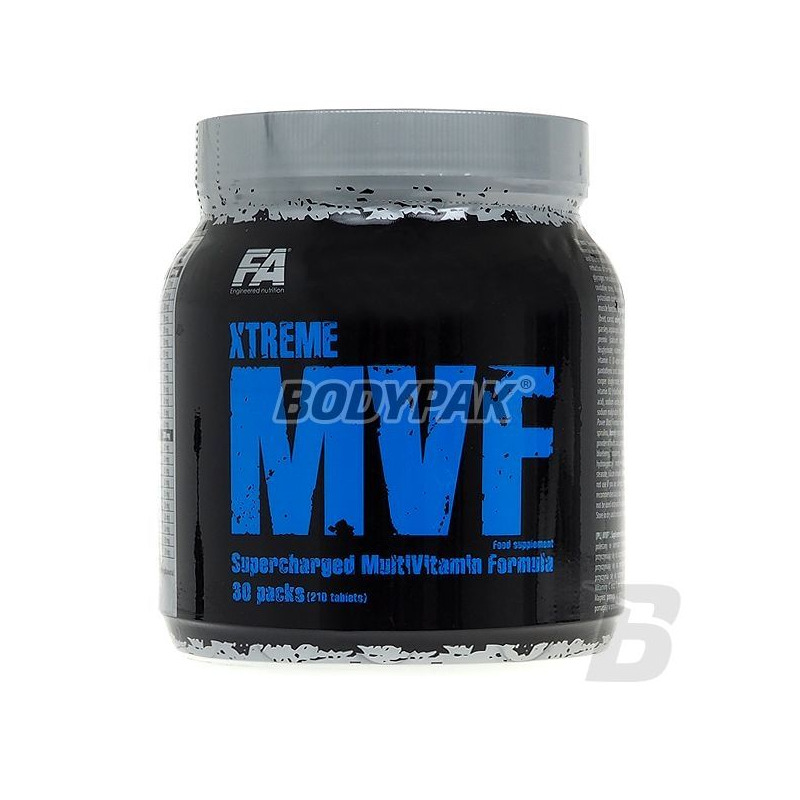 Xtreme MVF® was created in response to the demand of the body in vitamins among hard training athletes. Intense physical training increases the demand for nutrients, including vitamins, minerals, and a number of physiologically active substances that should be supplied with the diet. Unfortunately, in most cases, provide such large quantities of nutrients is often very difficult during periods of intense training. In such cases, it points to the need supplementation with nutrients high quality with a high degree of bioavailability. Xtreme MVF® is the strongest and highly advanced blend of vitamin - mineral available on the market, rich in physiologically active substances, which are delivered through a unique blend of 2: Power Blast Formula and Antioxidant Energy Formula. Optimal portions of individual vitamins and minerals that make up Xtreme MVF® provide hard-working muscles to cover the increased demand. This increases stamina, rapid adaptation to training and effective regeneration after the exercise ended. Micro and macronutrients contained in Xtreme MVF® ensure the proper operation of the nervous and muscular systems, which is crucial for effective adaptation training. Furthermore, they stimulate the cells of the vessel to the growth, proliferation and differentiation. Thanks to improve natural immunity allowing you to maintain good health and a slim body during intense exercise, when the body is more susceptible to disease. In addition, the uniqueness of Xtreme MVF® evidenced by the fact that the Power Blast Formula and Antioxidant Energy Formula provide essential cofactors of metabolism, omega-3 fatty acids, enzymes, and the strongest known antioxidants supplied by strictly selected top-quality plant extracts, extracts of fruits and vegetables a very high value nutritional. Each of the extracts provide a number of physiologically active ingredients that can effectively degrade free radicals, but also reduce muscle pain, block the release of cortisol, resulting in protecting muscle against the loss of strength and endurance. Xtreme MVF® quickly complete all the losses that occur during intense training sessions so recovery time is shortened to a minimum, and another heavy training sessions can be performed at short intervals. Consume 4 tablets for breakfast and 3 tablets with lunch. Power Blast Formula: hydrolizat białka serwatki, sproszkowane nasiona lnu (Linum usitatissimum), sproszkowane ziarno pszenicy (Triticum aestivum), spirulina (Spirulina platensis), sproszkowane ziarno jęczmienia (Hordeums spp), chlorella (Chlorella pyrenoidosa), czerwone algi (Palmaria palmata)], premiks multiwitaminowy (palmitynian retinylu, cholekalcyferol, octan d-alfa tokoferylu, kwas L-askorbinowy, monoazotan tiaminy, ryboflawina, amid kwasy nikotynowego, chlorowodorek pirydoksyny, kwas foliowy, cyjanokobalamina, d-biotyna, d-pantotenian wapnia, cytrynian i jabłczan wapnia, diglicynian wapnia, diglicynian magnezu, cytrynian potasu, diglicynian miedzi, diglicynian manganu, chlorek chromu, diglicynian cynku, jodek sodu, diglicynian żelaza, L-selenometionina, molibdenian sodu). Vegetable Energy Blend: sproszkowane liofilizaty z: buraka, marchwi, pomidora, brokułów, kapusty włoskiej, szpinaku, kapusty, kalafiora, selera, pietruszki, szparagów, brukselki, ogórka. Fruit and Berry Energy Blend: sproszkowane liofilizaty z owoców: jagody Acai, granatu, mangostanu, Goji, czerwonych winogron, truskawek, wiśni, jagód, malin, czarnych porzeczek), substancje wypełniające: celuloza mikrokrystaliczna, hydroksypropylometyloceluloza, substancje przeciwzbrylające: kwas stearynowy, stearynian magnezu, dwutlenek krzemu.